Our 2nd tapestry commemorating the 10th anniversary of Nitro+CHiRAL. 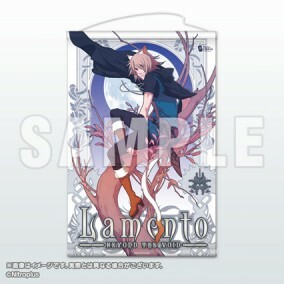 A tapestry featuring the Lamento -BEYOND THE VOID- package art to commemorate the Nitro+CHiRAL 10th anniversary! Includes Nitro+CHiRAL 10th Anniversary logo, making it the perfect way to celebrate. Lamento -BEYOND THE VOID-: Stained Glass Style Acrylic Panel - Konoe Ver. Lamento -BEYOND THE VOID-: Stained Glass Style Acrylic Panel - Rai Ver. Lamento -BEYOND THE VOID-: Stained Glass Style Acrylic Panel - Asato Ver.